Beyond playing the music itself as faithfully as possible, we have assembled an enviable collection of accurate gear to complete the sights and sounds of an authentic Beatles experience! Combined with our fancy suits, Beatle boots, and charming looks, you'll think you're back in 1964! Paul’s famous Hofner 500/1 violin shaped bass is the essential iconic image of The Beatles. He got his 1963 model in October of that year to replace his 1961 Hofner bass, often known as the “Cavern” bass, which he relegated to back up duty. It became his main bass and was featured on countless recordings and performances during their touring days. Dave uses a modern re-issue of the Hofner to help bring to life that iconic image and sound we all love. George received his 1963 Gretsch Country Gentleman when he was having repairs done to his 1962 model. It soon became his preferred guitar and was most famously seen on the historic Ed Sullivan Show performance on February 9, 1964. Mike plays an accurate reproduction of this classy guitar featuring gold plated hardware, Grover Imperial tuners, dual flip up mutes, and a Country Gentleman name plate. 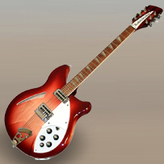 When George received his first Rickenbacker 360/12 in 1964 it quickly became a big part of The Beatles' sound through to 1966. Its one-of-a-kind jangle can be heard on many recordings from that era, such as the infamous opening chord of A Hard Day's Night to the driving lead of If I Needed Someone, and added a whole new texture to the mix. On the songs that call for it, Mike picks up his trusty "Fireglo" 12 string and adds that flavour that only the Rickenbacker can produce. George's 1963 Gretsch Tennessean offered the perfect country twang to many classic Beatles recordings from 1964 to 1965. It was featured in the movie Help! and was also famously seen during The Beatles' record breaking performance at Shea Stadium on August 15, 1965. Mike plays a fantastic re-issue of the Tennessean when that authentic twang is needed, such as in songs like Everybody's Trying To Be My Baby and Act Naturally. 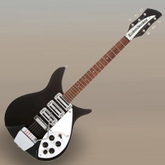 John got his 1964 Rickenbacker 325 as a gift from Rickenbacker while they were getting ready for their second performance on the Ed Sullivan Show, this time in Miami Beach, Florida. It was meant to replace his old 1958 325 that had become quite road worn from its heavy use during the Hamburg and Cavern days. This 1964 model became John’s main guitar for both studio and stage use right up through 1965. The Rickenbacker 325c64 that Marty uses on stage with The Day Trippers is a faithful reproduction of this beautiful instrument. In an effort to promote the latest and the greatest from Ludwig, the drum company gave Ringo a brand new Super Classic kit on May 31, 1964 which was comprised of drums with larger dimensions than his previous kits. This 1964 set soon became Ringo's preferred kit and was used on the most Beatles records out of all his drums. The vintage Ludwig kit on which John drives the beat with The Day Trippers is an authentic 1964 Super Classic kit that has been lovingly restored with black oyster pearl wrap and all period correct hardware. To top it off, a matched set of 60s era Zildjian crash, ride and hi-hat cymbals round out that great Ringo sound. In their touring days The Beatles were synonymous with Vox amps and the AC-30 was a signature part of their sound for some time, both in the studio and in some early live performances. Since having the right guitars is only half the equation, Mike and Marty play through a pair of great sounding AC-30s that offer all the great vintage features and tone needed to complete the authentic sound of The Beatles music. At the famous Washington DC performance that gave the United States its first glimpse of a live Beatles concert Paul used a Vox AC-100 bass head plugged into a T-60 speaker cabinet. Vintage AC-100s are hard to come by these days and are typically fraught with maintenance issues, so we did the next best thing. We put a modern Vox bass amp chassis into a replica AC-100 head cabinet and paired it with a matching replica T-60 speaker cabinet. It gives us a great vintage sound along with that great Vox look on stage.